This stunning kitchen features a combination of GFRC countertops, board-formed concrete pillars alongside the cabinets, and a concrete floor overlay, all in natural gray. Another view, showing the details in the concrete pillars, which were board-formed with strips of plywood to mimic the look of concrete walls in an old building. A close-up view of the countertops, made with a lightweight GFRC mix. 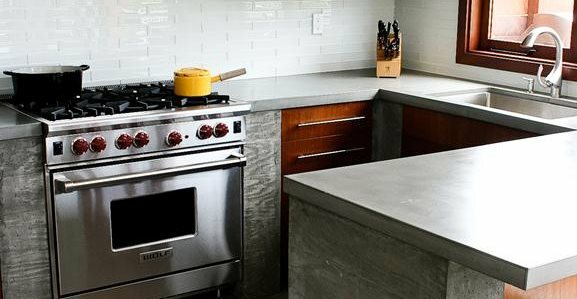 For this residential kitchen makeover project -- for a client who prefers to use natural, eco-friendly materials -- concrete was the perfect fit. In addition to choosing concrete for his countertops, he also wanted to overlay his existing floor with a concrete floor overlay and use board-formed concrete pillars to flank the ends of his cabinets. He preferred to keep the concrete a natural gray, but wondered if the gray-on-gray effect would be too boring and monotone. "The client already knew what he wanted. 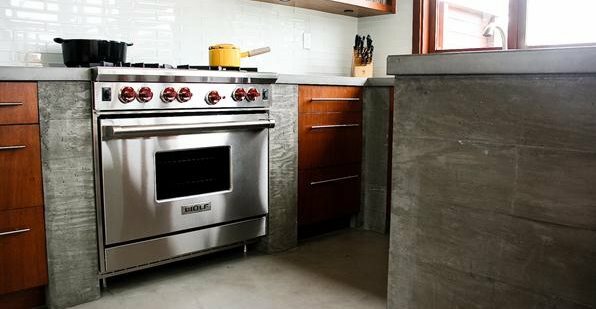 He had seen board-formed concrete on a structural wall in an old building and wanted to incorporate the look into his kitchen. He told us he wanted it to be very natural and simple, but he was concerned that all the gray would be a little too monochromatic. We showed him some similar projects using gray, and he saw that by working with different textures and finishes, you can achieve a timeless look," says Brock Greenberg of Concrete Wave Design, who, along with partner Andrew Noble, poured and formed all of the concrete. For the board-formed pillars, Greenberg wanted them to look as if they were poured in place and the cabinets were built around them. "Since we do all of our casting off site in our shop, we had to come up with a different way to achieve this look," he says. "We started by ripping down ½-inch-thick plywood into 5-inch strips, then built our forms as normal. After properly sealing the wood, we then placed the strips into our mold in a random order and sprayed them with several coats of release agent before pouring the pieces." After removing the forms, Greenberg gave the exposed surfaces a very light acid etch and sealed them with a penetrating sealer. 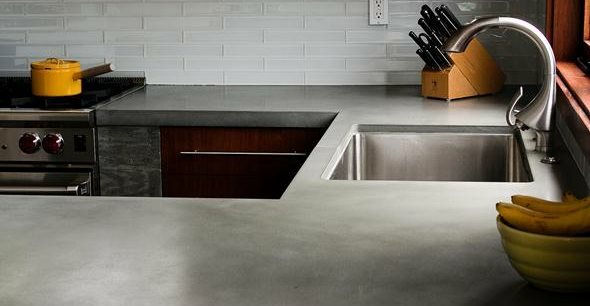 For most of their countertop projects, Concrete Wave Design prefers to use glass-fiber-reinforced concrete versus standard wet-cast concrete. "With different techniques, we can get GFRC to pretty much look like any kind of concrete you would want," says Greenberg. The lighter weight of GFRC is another reason Greenberg prefers to use it. "We are a two-man operation, so one of the biggest advantages for us is the weight factor. We used to have to get help on every install we did, but now with GFRC, we can deliver and install pieces up to 12 feet long with ease," he says. Concrete Wave Design has come up with its own GFRC mix, which incorporates polymer, sand cement, fibers and a plasticizer. They also have variations for their GFRC mix so they can achieve different looks. The client didn't want to worry about staining of his countertops, so Greenberg protected them with a topical sealer, taking care to keep the look natural. "Straight out of the can, the sealer will give the concrete a plastic look. We've come up with a very effective way to matte down the shine of the sealer, leaving behind a soft, natural glow rather than a harsh, fake gloss," he says. Before Greenberg could cover the kitchen floor with the concrete overlay, a lot of prep work was required. "The existing subfloor had staggered layers of ¾-inch-thick plywood, glued and screwed together. We stapled sheets of metal lath to the floor and topped that all off with an epoxy primer," he says. For the overlay, he used a cement-based self-leveling product that is highly abrasion resistant. He then protected the floor with a concrete sealer and densifier. Greenberg says that since he and his partner started Concrete Wave Design in 2005, he's noticed that fewer of his customers need to be "talked into" using concrete. "People are starting to get it, finally. When you open a design magazine, there will no doubt be at least one concrete countertop featured somewhere in it. It's no longer a mystery. People now come to us and know exactly what they want and exactly what to expect. We like to work with people who can appreciate something unique, and not what their neighbor has."